Federal authorities filed the first criminal charges in the investigation of the Sept. 11, 2012, terror attack in Benghazi, Libya, which left four Americans dead, CNN reports. Several suspects were charged, including prominent Libya militia figure Ahmed Abu Khattala. 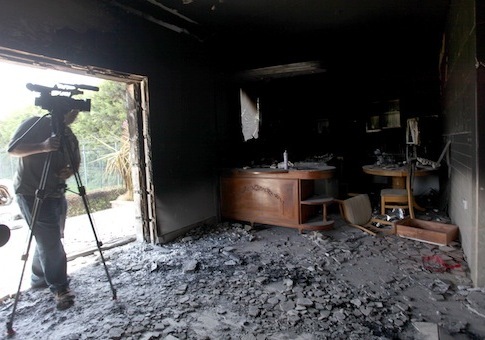 CNN interviewed Khattala, who denied involvement in the attack but admitted his presence in Benghazi. He said he has so far not been interviewed by Libyan authorities or the FBI. Other suspects and the charges sought by authorities are still unknown, but those close to the case say it is moving forward, according to CNN. [W]ord of the development comes as the Justice Department has come in for sharp criticism from congressional lawmakers about the pace and progress of the investigation. Attorney General Eric Holder had earlier this year promised congressional lawmakers the Justice Department would soon make public what actions it would take. "We have identified many of the parties involved," Rep. Adam Schiff (D., Calif.) told CNN. "We're still trying to identify what the command-and-control structure would be. A lot of missing pieces still, but we are finally making progress." This entry was posted in Politics and tagged Benghazi, Obama Administration. Bookmark the permalink.